I just returned from another trip to India. On my second day there, I was eating lunch at my aunt and uncle’s house, setting out the tiered tower of stainless steel tiffin containers to reveal finely cut green bean curries, sambar, rasam and other South Indian staples. In an attempt to be polite, I served my uncle first, scooping out a spoonful of rice fresh from the pressure cooker. “Oh, we don’t do the rice first…,” my aunt began, waving her hand in an attempt to interrupt my hovering spoon’s path. And then she explained that Brahmins don’t let the rice touch the plate before some curry has been put down first. Well, not all Brahmins, my uncle added, just our kind, and he makes the horizontal motion across his forehead indicating the marks of a Siva worshipper, as opposed to the trident-shape mark of the Vishnu followers. Damn, did it again! Rule-breakin’ in Chennai. Bless my eternally accommodating extended family as I transgress, they laugh, and then explain. I learn the rules, one by one, if not necessarily the reasoning behind them. Repeat. It was a reminder that my essay “A Hundred Unspoken Rules” that was originally published in Killing the Buddha still stands true. 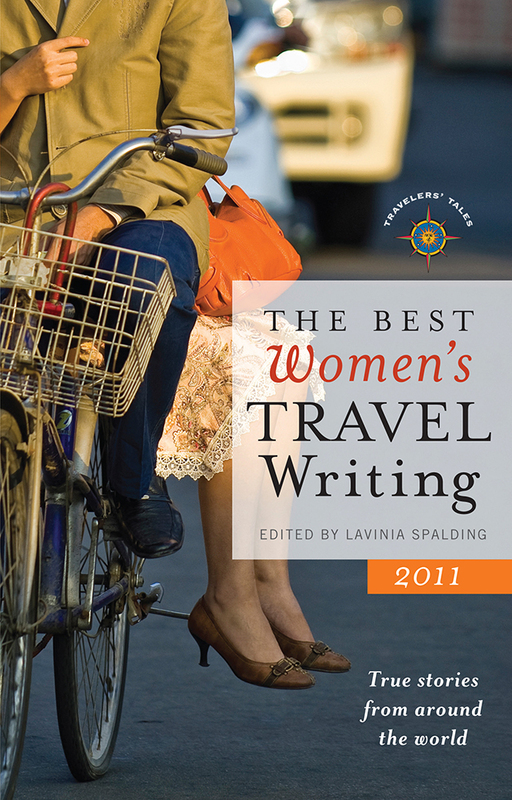 I’m happy to report that it was selected for the anthology The Best Women’s Travel Writing 2011, edited by Lavinia Spalding and just out from Travelers’ Tales. It should be arriving in bookstores soon, but in case you prefer arm-chair shopping to complement arm-chair traveling, then you can get it now on Amazon. In addition to my South Asian bumblings and ruminations, you’ll find true stories about having lunch with a mobster in Japan and drinks with an IRA member in Ireland, and learn the secrets of flamenco in Spain and the magic of samba in Brazil. You can deliver a trophy for best testicles in a small town in rural Serbia, fall in love while riding a camel through the Syrian Desert, ski a first descent of over 5,000 feet in Northern India, and discover the joy of getting naked in South Korea. And then, maybe, think about where your next adventure might lead you. KtB just turned ten! Join us to celebrate on December 7th in Brooklyn, New York. Poster by the ever-talented Danica Novgorodoff. For the past three years, i’ve been in the buddha-killing business and it seems a fine time to celebrate. And ten years! Ten years old isn’t much for a tree. A ten-year-old religion hardly even deserves to be called one. But for a website? Ten years is ancient. It’s venerable. It’s wise. That’s why, on December 7th, KtB is putting on a Tin (Tenth) Anniversary Spectacular at the Galapagos Art Space in DUMBO, Brooklyn. 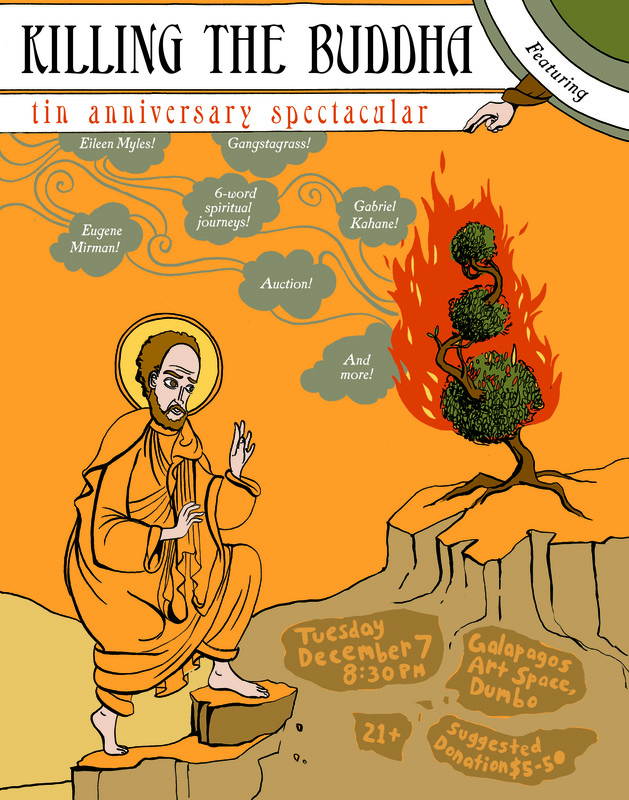 It’ll feature a Decadent Decalogueof performances by friends of the magazine new and old, including Gangstagrass, Gabriel Kahane, Eugene Mirman, Eileen Myles, Rev. Osagyefo Uhuru Sekou, and others. There will also be Buddha-killer drink specials, 6-word testimonies, a DJ afterparty, and unmentionable surprises. KtB editor Quince Mountain (Worldwide College of Auctioneering Class of ’96) will officiate over a live and silent auction. All proceeds go to Killing the Buddha, which has always depended on reader contributions, so that it can support more exemplary writing and continue to bring people together offline at live events around the country. More info here and RSVP on Facebook. I have a new piece up on Killing the Buddha this morning, on death and life and that time in between. It’s also about flying houses and balloons and dogs and chocolate.